Stunningly remodeled beachfront condo w/panoramic views of the OCEAN from practically every room in the sought after Madeira Vista!!!! This beautiful home boasts appointments including a gourmet kitchen w/granite countertops and breakfast bar, upgraded, paneled wood cabinetry w/soft close drawers, custom lighting, travertine backsplash w/mosaic inserts, stainless steel appliances, bronze fixtures, Moen pearl nickel faucet and travertine backsplash, eat in kitchen area w/buffet niche and tile floors, family room and dining area w/Wainscoting, crown molding and amazing views of the sandy white beaches through your NEW PGI hurricane rated impact windows w/travertine sills, immense master bedroom w/plush carpeting, ceiling fan w/light kit, double closets w/paneled solid doors and custom paint, master bath w/granite countertops, white-wash cabinetry, integrated sink, encased mirror and shower w/tiles to the ceiling w/mosaic accents, guest bath w/antique white furniture cabinetry w/granite countertop, Kohler lavatory and custom mirrors, guest bedroom w/like new carpeting, dual solid closets and more. 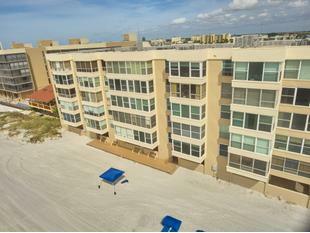 Amenities include beachfront covered area with picnic tables, electric grills and a recently renovated, heated in-ground pool with paver decking. Building exterior recently updated (paint, hallway flooring, beach deck). If you choose to use this residence for RENTAL income; both the managers for property maintenance and for the rental program live on premises. Unit is already rented through April of 2019! !